The Convenor of the Sri Lanka’s major university students union “Inter University Student’s Federation” IUSF “Anthare” Sanjeeva Bandara has been remanded till 15 July. Colombo Fort Chief Magistrate Thilina Gamaga remanded Sanjeeva Bandara for allegedly breaking his Bail conditions. Last week he was issued summons and ordered to appear before court on July 8 to inquire into the breaking of his bail conditions. The Colombo Crimes Division informed the Fort Magistrates Court that Bandara was granted bail on condition that he would not be a member of any unlawful gathering. 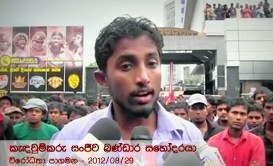 The CCD said that his participation in the recent protest march to Nugegoda was a violation of this condition. Meanwhile releasing an announcement National Organizer of Socialist Students Union (SSU) Dr. Nalinda Jayatissa said that the government’s agenda of destroying free education, which is a property of the masses, should be defeated and all should rally to protect free education states an protesting against remanding of the convener of IUSF Sanjeewa Bandara on false charges.